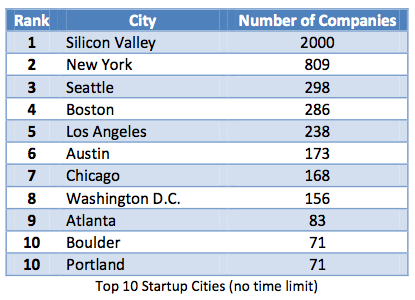 Lots of US cities claim they’re the best place to do a startup. So where are entrepreneurs actually starting companies these days? TechCrunch reader Yuval Baror took a look at CrunchBase to try to answer the question. His most surprising result is that New York has been getting quite a few more startups than other cities outside of Silicon Valley. There is something to all the hype being cooked up by New York media companies and politicians, apparently. 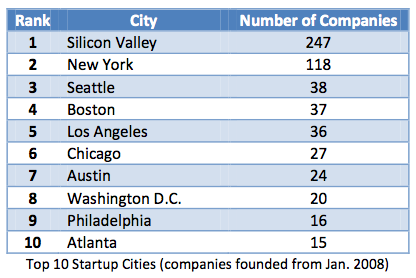 Of course, the San Francisco-Silicon Valley region is still the clear leader. Here are the results. I’ll follow with some discussion of the methodology, and explain why you shouldn’t read too much into the numbers. 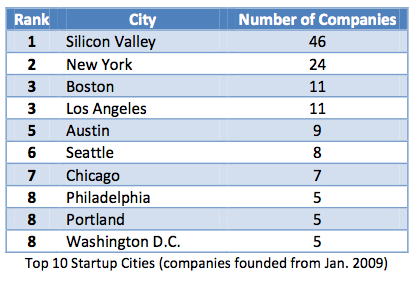 Over the last two years, CrunchBase indicated that 46 companies were founded in Silicon Valley, followed by 24 in New York, and 11 apiece in Boston and Los Angeles. If you include all of 2008, the number rises dramatically, with Silicon Valley increasing its lead. And that trend continues if you remove any limitation on the time of founding. Beyond the unsurprising Silicon Valley numbers, New York still comes in way ahead of all of the other cities. But hold on. Don’t all these numbers look ridiculously low since CrunchBase lists almost 80,000 companies? Yes. Many companies don’t provide their founding information, or headquarter locations, so they won’t show up correctly here. However, this missing data is presumably a trend that’s consistent across all companies everywhere. It’s possible that Silicon Valley companies are more likely to self-identify as Silicon Valley companies, for example, but we don’t have any evidence either way. More broadly, a startup can mean a lot of different things to different people. Self-identifying as a small business versus a startup obviously skews the results here. TechCrunch is itself a good example: Michael Arrington started it as a side blog, and he didn’t think about it as his main business until it was taking off. A new Mexican restaurant in Omaha might not look like a startup now, but maybe it’ll become a chain one day. Another wrinkle in the methodology is that Baror queried all companies located within 10 miles of a given city to try to capture the relevant suburbs. But he expanded that to 50 miles for San Francisco to capture Silicon Valley. And then, of course, there’s the international question. How do Beijing and London and everyone else stack up? If you feel like running the numbers before I get to it, send over the results and I’ll write them up. You can reach me at my increasingly spammed email account, eldon (at) techcrunch (dot) com.